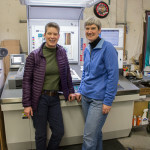 The printing of the premier issue of Whidbey Life Magazine is underway and we took a tour of our fine printer, LithTex in Bellingham to see the action. And we got a bonus; LithTex had coordinated their schedule to have the magazine printing while we were there, so we saw some of the freshly printed sheets fly off the press. [/vc_column_text][/vc_column][/vc_row][vc_row][vc_column][vc_single_image image=”24406″ img_link_target=”_self” img_size=”full”][vc_column_text]The offset printer used to print the first issue of Whidbey Life Magazine. [/vc_column_text][/vc_column][/vc_row][vc_row][vc_column width=”1/1″][vc_gallery type=”image_grid” interval=”3″ images=”24403,24401″ onclick=”link_image” custom_links_target=”_self” img_size=”medium”][vc_column_text]Top view of the six-station Lithrone sheet-fed offset printer showing the CMYK (cyan, magenta, yellow, black) ink wells. On the right is a close up of the cyan ink well. [/vc_column_text][/vc_column][/vc_row][vc_row][vc_column width=”1/1″][vc_single_image image=”24405″ alignment=”center” img_link_target=”_self” img_size=”large”][vc_column_text]Shawn VanDyken, our beloved sales rep, demonstrates how paper is fed into the printer. [/vc_column_text][/vc_column][/vc_row][vc_row][vc_column width=”1/1″][vc_single_image image=”24397″ alignment=”center” img_link_target=”_self” img_size=”full”][vc_column_text]Printed pages are produced at more than 14,000 per hour. These are the first WLM pages coming off the press. [/vc_column_text][/vc_column][/vc_row][vc_row][vc_column width=”1/1″][vc_single_image image=”24396″ img_link_target=”_self” img_size=”large”][/vc_column][/vc_row][vc_row][vc_column width=”1/1″][vc_column_text]This press console reads across the printed page to check color levels and saturation. [/vc_column_text][/vc_column][/vc_row][vc_row][vc_column width=”1/1″][vc_gallery type=”image_grid” interval=”0″ images=”24400,24399,24402″ onclick=”link_image” custom_links_target=”_self”][vc_column_text]This press console reads across the printed page to check color levels and saturation. Mark Burke pulls a sheet from the printed stack and then checks color for adjustments. In the photo on right, Mark adds black to the ink well. [/vc_column_text][/vc_column][/vc_row][vc_row][vc_column width=”1/2″][vc_single_image img_link_target=”_self” image=”24404″ img_size=”medium”][/vc_column][vc_column width=”1/2″][vc_column_text]Pages are printed in sets of four on a single sheet. This stack will move to assembly once the other pages are printed. [/vc_column_text][/vc_column][/vc_row][vc_row][vc_column width=”1/1″][vc_single_image image=”24407″ img_link_target=”_self” img_size=”large”][vc_column_text]The final step before packing into boxes. Shawn shows how the magazine will be assembled and then saddle-stitched. [/vc_column_text][/vc_column][/vc_row][vc_row][vc_column width=”1/1″][vc_single_image image=”24398″ img_link_target=”_self” img_size=”medium” alignment=”center”][vc_column_text]Jan Shannon and Sue Taves in front of the color station. [/vc_column_text][vc_column_text]Whidbey Life Magazine will be “popping out of the cake” at the celebratory launch party on April 25 at Freeland Hall. Find out more about all the entertainment for the launch party here. This is so exciting! Can’t wait to see the first issue. Thanks for coming to visit our plant; we had a great tour. And the dogs were a huge hit with everyone (yes, even with our own Barley)! You’ve done a superb job putting together this magazine — your readers are in for a real treat! I’m eagerly anticipating next week’s roll-out. Thanks that was a great tour! That’s mighty fine. Thrilling times. I can’t WAIT to see the magazine! whoohoo!!! can hardly wait! Congrats! Love seeing this preview of coming attractions! Will watch for the magazine ! I used to work as quality control in computer chip fabrication, and these pics brought back memories of being part of a team like that. Congrats!